Embark all natural dog food is one of our most popular grain-free dog foods. It is AAFCO complete and balanced for all life stages, made with dehydrated cage-free turkey, vegetables, fruits and love. 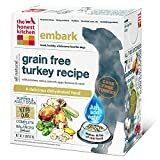 Embark is higher in protein and fat recipe than our average dog foods. It’s perfect for puppies and active adult dogs, especially agility dogs who need a performance dog food. Because Embark is a grain-free dog food, it’s great for pups who have dog food allergies or sensitivities to grains, gluten or those who need a low carbohydrate dog food. Just add warm water, wait 5 minutes, and serve for a fresh, wholesome and human grade meal. Embark is 100 percent human-grade, and contains no red flag pet food ingredients like corn, soy, rice, beet pulp or wheat. Ingredients are dehydrated cage-free turkey, organic flaxseed, potatoes, celery, spinach, carrots, organic coconut, apples, organic kelp, eggs, bananas, cranberries, tricalcium phosphate, choline chloride, zinc amino acid chelate, vitamin D3 supplement, vitamin E supplement, potassium iodide, potassium chloride, iron amino acid chelate, copper amino acid chelate. Contains minimum 29 percent protein, minimum 18 percent fat, maximum 9.6 percent fiber, maximum 7.8 percent moisture, 488 calories per cup. Open a bag and indulge your 4-legged pal with a delicious experience – conveniently packaged as a 3 flavor assortment! GRAIN FREE COMPLETE HEALTH: grain free, complete and balanced everyday nutrition for your cat. 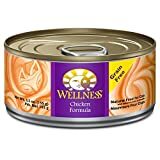 ;QUALITY INGREDIENTS: Delicious pate made with quality proteins, including chicken combined with essential vitamins and minerals. ;ALL NATURAL: Contains only premium, all natural ingredients with no meat by-products, artificial flavors, colors or preservatives. ;MADE IN NORTH AMERICA: Backed by the Wellness Guarantee and proudly made only in North America. ;SUBSCRIBE & SAVE: Hassle-free way to save 5% and always keep your pantry stocked.